I love tomatoes. One of my staples when grocery store shopping is always canned tomatoes. I love them to make salsa, add to black beans, or add to rice with mojo sauce for a Cuban side dish. So when Tuttorosso asked me to try some of their products I obliged. Not only did they send me 3 large cans of tomatoes, they sent me a really cute apron. Call me a nerd, but I love aprons! With the tomatoes they also sent some recipe cards. I decided to try the Italian Tomato Pasta Bake. 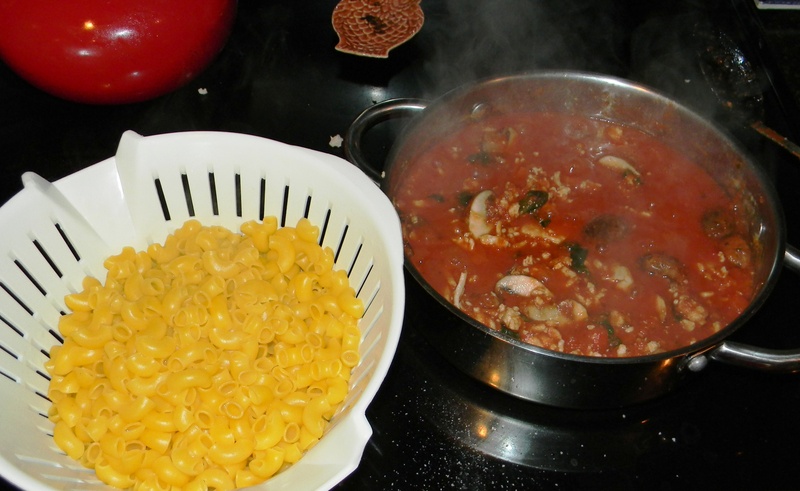 It seemed very easy yet sounded delicious and I needed to carbo load for a run I was going to do the next day. This recipe called for their Crushed Tomatoes with Basil. In addition to the ingredients the recipe called for, I decided to add some of the veggies I had around the house. I just added them to the sauce and let them simmer with the meat and basil seasoning. 1. Preheat oven to 350F. Prepare a 13x9x2 inch baking dish with nonstick cooking spray. Cook penne pasta according to package directions. Drain well; cover and keep warm. 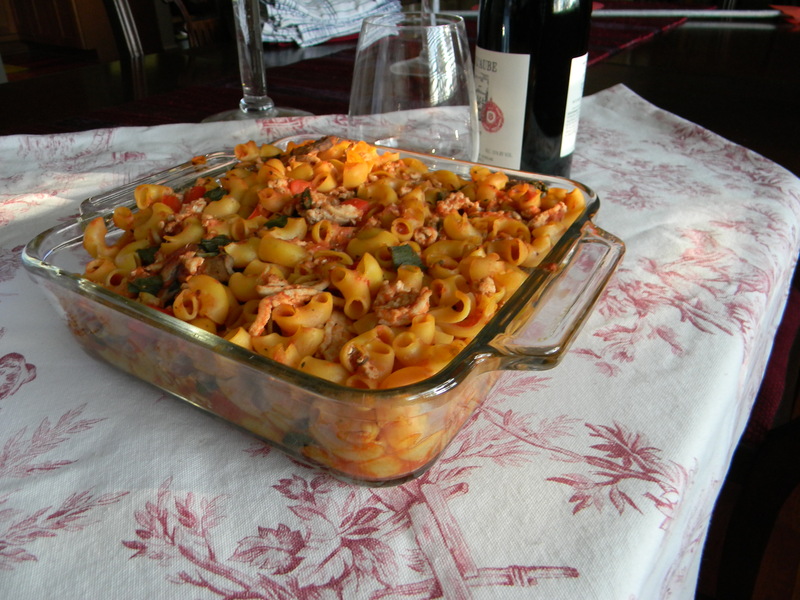 In a prepared baking dish, brown ground round in microwave oven; drain well. 2. 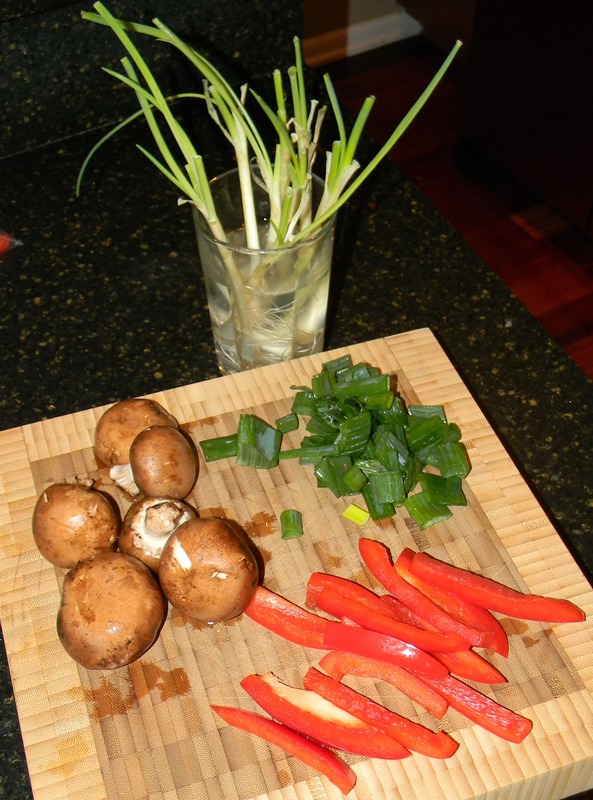 Add green bell pepper, mushrooms, TUTTOROSSO® CRUSHED TOMATOES in thick puree with basil and salt; mix well. Return to microwave and bring mixture to a boil. Remove from microwave and add pasta; mix well. (Note: our microwave was broken, so I just cooked everything in a pan on the stove. It caused a delay in cooking time and dirtied an extra dish, but it did not impact flavor). 3. Cover and bake in oven for 15 minutes. Remove from oven and sprinkle with cheese. Bake uncovered an additional 5 to 10 minutes or until cheese is melted. The finished product was delicious! My only suggestion is that you really should pay attention to the salt to taste. Mine needed a little more than I originally thought. This is one dish I will most likely be trying again. One lucky Gluten Free Jacksonville reader will win a prize pack that includes: the cute apron I am wearing and an assortment of Tuttorosso’s canned tomatoes. To enter the drawing comment on this blog post. The winner will be announced next week. This one is definitely a crowd pleaser. I’m not much of a cook, but this recipe seems easy enough to make for my husband who has been gluten free for medical reasons for about 10 years! 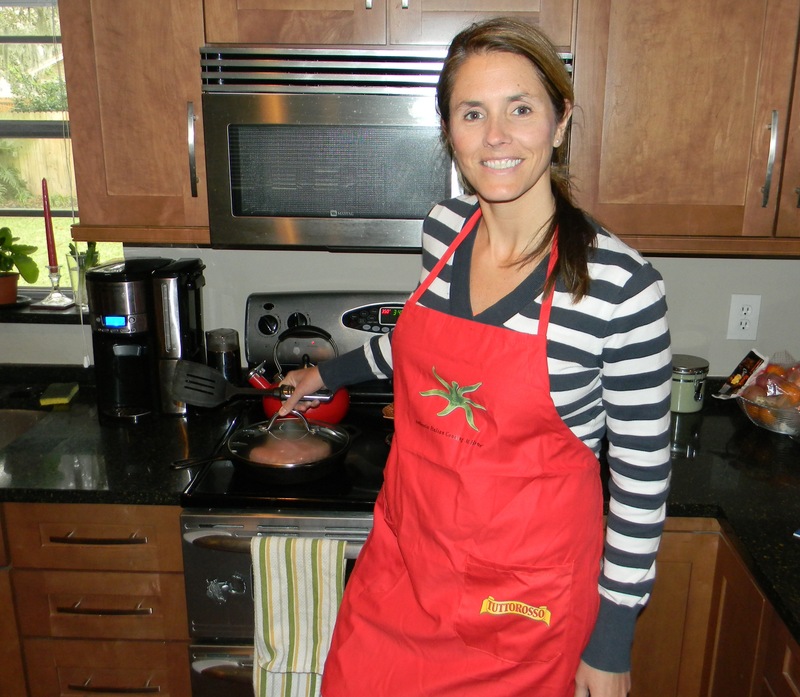 I would love to add this apron to my collection and try the canned tomatoes with that recipe, looks easy and yummy! Yum! I’d love to learn more about the dishes you cook at home. Keep the recipes coming! 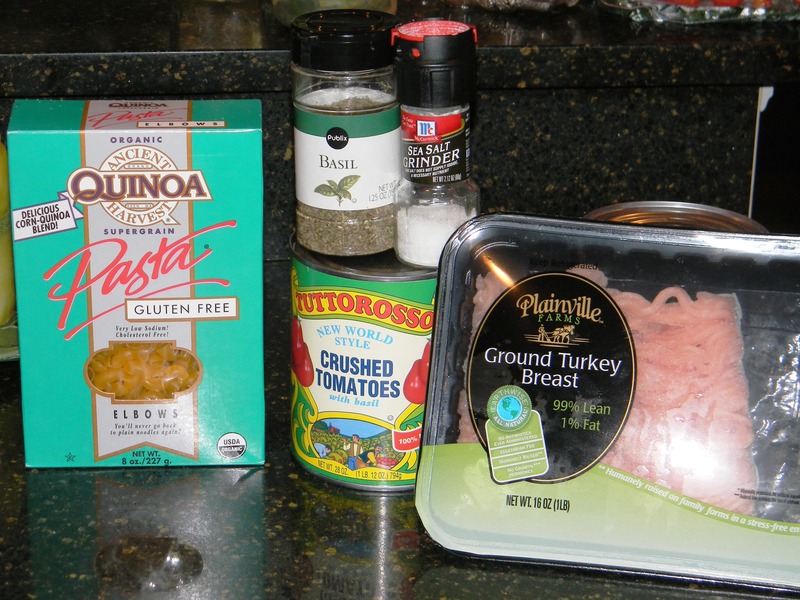 I love the quinoa pasta!! I use it often. I love that I no longer need to shop at a health food store for my gf products. Publix has really stepped it up! Also, that looks delicious! Keep the recipes coming! The quinoa pasta is my favorite. It seems to be the closest to the “real thing” in terms of texture and it doesn’t get all mushy and sticky. I use canned tomatoes at least once a week in my cooking. Sounds wonderful. Just now getting into GF. This is a twist on one of my family favorites. Can’t wait to try it. Thanks. Thanks for sharing. This looks easy and yummy! Please keep the great recipes coming. Congrats Lindsay! You are the winner! 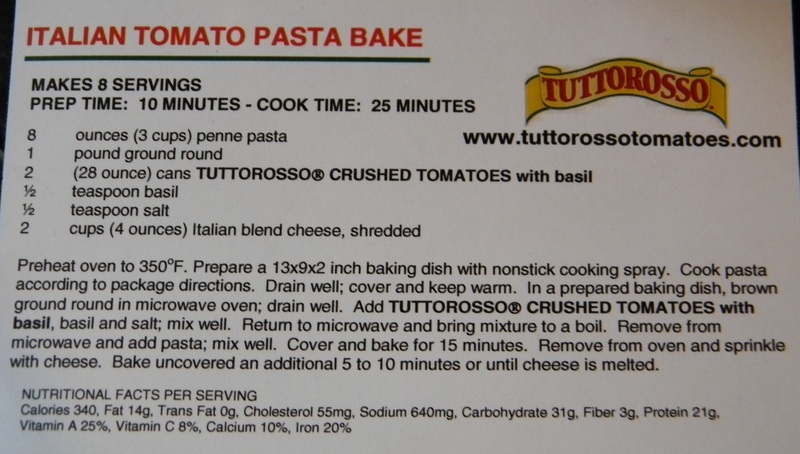 Please send me a message to jgornto_6(at)yahoo.com so I can get your information to mail you your apron and Tuttorosso goodies! Their tomato products are great!! Been using them for years.